One of the most spontaneous and exciting jazz gigs I’ve been privileged to experience was at The Candlelight Lounge in Tremé, New Orleans back in 2010. 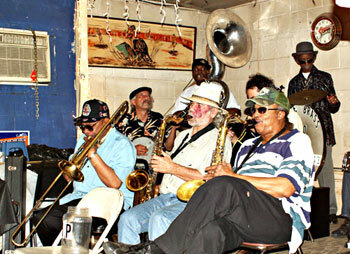 Treme Band with “Uncle” Lionel Batiste on drums. 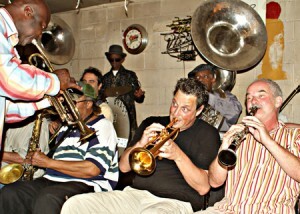 Every Wednesday night at this cradle of jazz, The Tremé Brass Band played for free. What’s more, we enjoyed red beans and rice before the show started. French Quarter Festival guest musicians with The Treme Band. 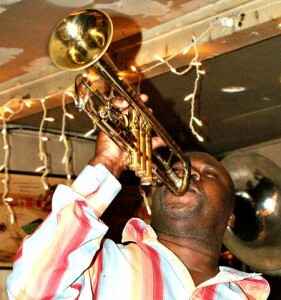 Band leader Kenneth Terry lets rip on trumpet. Sadly “Uncle” Lionel is no longer with us. This was one of the first posts I featured on Jazz&Jazz. High time I featured it again!